The bio-conquest reaches the beauty sector and is entrenched as the firmest trend in the cosmetic market. The reasons? A healthy lifestyle philosophy that promotes well-being, results and respect for the environment. Cosmetic oils formulated with natural ingredients, greasy or dry texture and demonstrated efficacy, are imposed as basic in the beauty routine of millions of consumers. They have become the star texture of today’s cosmetics and that is, despite being oily, the current formulas are extremely light, nothing sticky, absorb easily and leave the skin soft and luminous. A good oil does not grease the skin as it leaves no residue on the surface. It does not leave shine thanks to its rapid penetration and treats the skin in depth. FOR ALL KINDS OF SKIN. GLOW EFFECT regardless of the cutaneous type. DRY: Hydration is one of the biggest benefits of these elixirs that help retain moisture and prevent dehydration throughout the day. NORMAL: They keep the skin soft and moisturized and improve the tone of the complexion. OILY: And here is where the million dollar question comes in, why add oil to oily skin if you want to avoid more sebum production? Precisely because it decreases. Nature is clever and it knows aggressive cosmetics dry the skin creating an imbalance before which the dermis itself is forced to produce even more fat. It’s the dreaded rebound effect. With a few drops is enough and so is specified in its mode of use. Due to its rich and unctuous texture, small amounts of product are required and therefore it is always spoken of in drops. They extend with the fingertips by subtle movements, without rubbing or massaging, from the center of the face to the outside. They should not be used as a single treatment since, although they are highly moisturizing, they do not contain water so they should be complemented with other cosmetics. 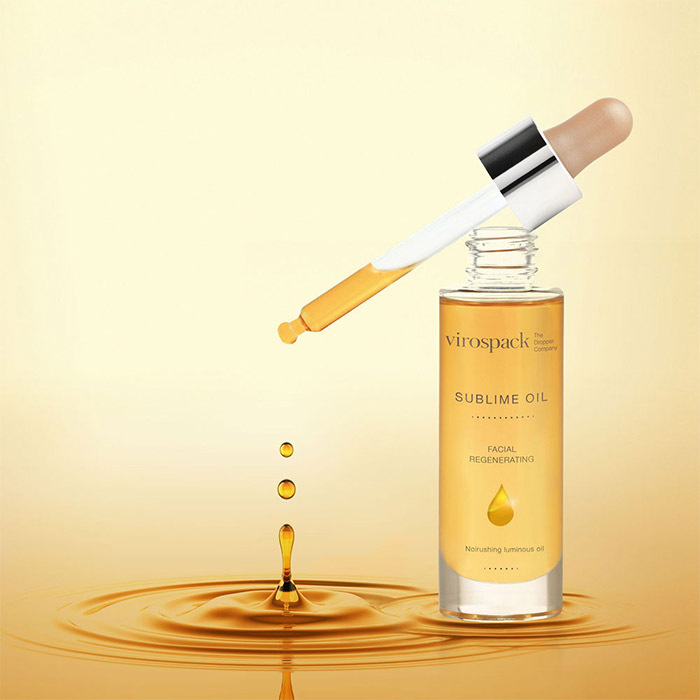 Due to its low viscosity, rich texture, high concentration of fatty acids and the small amount required in each application to obtain visible results, the dropper is the ideal packaging for these products. A boom in the current market of cosmetics every day more and more extended. And always drop by drop. Virospack with its wide range of standard references, materials, designs, sizes and finishes, offers customized solutions suitable for oily formulation cosmetics. Oils for the care of the skin, hair, beard or nails, in a dropper of high precision and safety in its dosage and application. A cosmetic pack fully compatible with the oily formula after having passed the tests carried out in our department of testing laboratory. A quality package guaranteed after having passed the strict tests of our quality department. Unique oils for the skin in a unique dropper. A personalized presentation according to the desires and positioning of the brand, thanks to our large range catalogue of components and decoration techniques, all made in our own facilities. THE EXTRAORDINARY POWER OF ESSENTIAL OILS IN A SINGLE DROP.